Tony Hawk's Pro Skater 2 is an extreme sports game that was first released on the Sony PlayStation in 2000. The levels have been increased in this sequel from six to ten and include locations such as New York City, Venice Beach and a Bullring in Mexico. The objectives have also been raised to ten per level with much more variety and trick-specific goals. The main control innovation is the introduction of manuals; these are performed by quickly pressing Up then Down on the d-pad and they allow you to link tricks together for much bigger scores. This seemingly minor addition opens up gameplay possibilities as it connects the levels and trick objects together in a way that felt much more isolated in the first game. Using the C buttons to activate tricks is a little uncomfortable, as you need to grip the N64 controller at an awkward angle when using the d-pad; however, once you adjust the gameplay is just as enticing as ever and landing tricks with precision is never an issue. The smooth, consistent frame-rate (apart from in the Bullring level) is also partly responsible for this. The levels are solidly designed and figuring out how to access hidden areas or Secret Tapes is a real joy that never gets old. The biggest reason to play this port is that load times are almost non-existent. 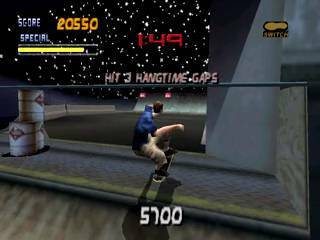 However, although the music has always played a huge part in the THPS experience, here it's very low in the mix and many of the tracks either lack vocals or are heavily edited. Likewise, this port is missing many of the skater videos that Dreamcast and PS1 owners enjoyed when completing the game with certain characters. The draw distance isn't the best too which leads to pop-in that makes it harder to locate some items. From a gameplay perspective, Tony Hawk's Pro Skater 2 successfully captures the magic of the PS1 original and it's held up remarkably well. Saying that, this does feel like a slightly neutered port and although it's still a fantastic game you'd be doing yourself a great disservice by playing this cartridge version due to its various omissions. Random trivia: Another sequel called Tony Hawk's Pro Skater 3 was released on the Nintendo 64 in 2002.